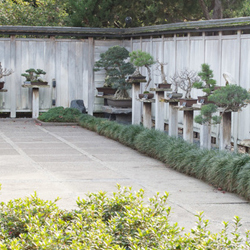 GSBF currently maintains three Bonsai Collections. One in Northern California at the Bonsai Garden at Lake Merritt and one in Southern California at the Huntington Botanical Gardens and one located at the Shinzen Japanese Friendship Garden in Fresno, CA. In a joint effort to build a world-class bonsai collection for the public in Southern California, the Golden State Bonsai Federation and the Huntington Library and Botanical Gardens established the GSBF Collection at the Huntington in 1993. Today, the growing collection features bonsai masterpieces and viewing stones from noted artists throughout the region, and is curated by Ted Matson. 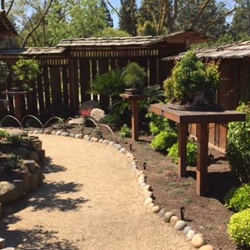 The bonsai garden officially opened its doors with a grand opening celebration on October 17 & 18, 2015, at the Shinzen Friendship Garden in Woodward Park, Fresno, California. 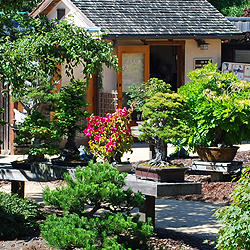 The bonsai collection is a partnership dedicated to the preservation and advancement of bonsai in the Central Valley. Discover a living art display with over 100 museum quality bonsai, offering stunning rotating seasonal displays. Docent tours available. Visit the Shinzen Garden – Experience a serene and beautiful North American Japanese Garden.